Yggdrasil, 1824. Courtesy Fortean Picture Library. In Scandinavian mythology, Yggdrasil or Igdrasil, is the world tree, an evergreen that overshadows the whole world. The name may come from Yggr, which was one of the many names by which Odin was known. Yggdrasil is the guardian tree of the gods. Heaven and hell are bound together by its roots and branches, and the gods meet daily beneath its branches to sit in judgement. It is said to actually link together nine worlds, including those of the giants, the gods, and the dead. 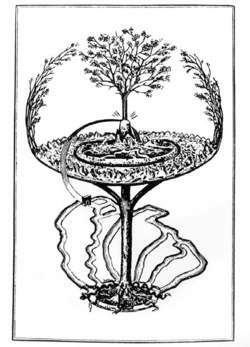 Yggdrasil is fed by three main roots: one in Asgard which is watered daily from Urd's fountain by the three Norns who decide the destiny of men; one in Niflheim, watered by the spring Hvergelmir; and one in Midgard which is watered by the underworld giant, Mimir's well of knowledge. Odin's spear, Gungnir, was made from a branch of the tree. Odin was the god of death and battle. He was the Wodan of the Germans and the Woden of the Anglo-Saxons. He was believed to welcome into his halls those warriors who died a heroic death on the battlefield. Mythology says that Odin hung from the World Tree for nine days and nights while pierced with a spear. He fasted as he hung there as a sacrifice. Afterwards he was able to bend down and lift up the magical runes which brought secret knowledge to men. Vithofnir, a golden rooster, sits on top of the tree, and an eagle sits on the highest branch with a falcon perched on its head. That branch shades Valhalla. The eagle and the falcon report all that they see to the gods who meet below. Gnawing at the roots of the tree is the serpent, Nidhoggr, the World Serpent. A squirrel named Ratatosk runs back and forth between the serpent and the eagle, trying to stir up discord between the two. Four stags, Dain, Duneyr, Durathor, and Dvalin, feed on the upper twigs of the tree while their antlers drop dew on the world below. Odin's goat, Heidrun, the supplier of milk for the heavenly mead, browses on the tree branch known as Lerad.